Spring time is here and what better way to celebrate it than to bring your family to Tivoli Friheden in Aarhus. This place guarantees you and your kids lots of fun and entertainment much like the Tivoli Gardens in Copenhagen. Tivoli Friheden opens officially on April 1st and will continue to operate until September 19. Being the first to visit there ensures you get the opportunity to see and experience the latest rides and exciting activities the management has lined up for this year. 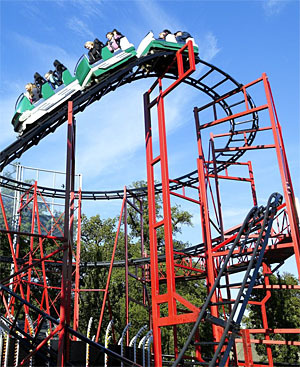 Among the rides visitors can try are the thrilling roller coasters and bumper cars. Get to know more about these rides and pick your choice or better yet, try them all. Stock Car – Also known as the bump car, this lets your drive anywhere you want and even bump into another car. Fire Alarm – Youngsters wishing to become fire fighters can practice here and find out what it’s like to be in a real fire situation. One just needs to get into a fire engine and head off to the fire scene before any other person does. Tivoli VanDvittig – This is the water world section covering an area of 5,000 square meters. Swimming and other fun water activities can be enjoyed here. Those who’d like to have barbeques can also do it in this area. Pjerrot Clown – This entertaining figure does magic tricks for kids inside his garden. Mrs. Frog and Mr. Rabbit – Take a photo with these two characters who serve as tourist guides inside the park greeting people visiting there every day of the week. Indoor Playland – Kids can jump up and down in the bouncy castles or dive into a large pond filled with rubber balls. There are also wheeler cars which they can drive around. Concerts – The Pjerrot Sunday Club holds concerts for kids while well known rock artists get to perform as well during themed weekends at the park.